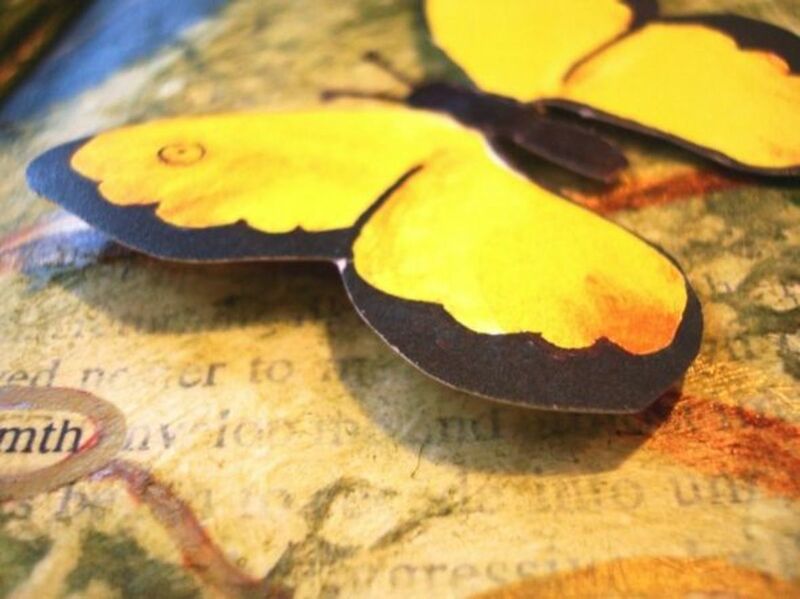 Altering books can be a fun way to express yourself while creating something beautiful. Art is a means of expressing the heart in a visual way, and altering books makes it easy to express yourself. Much can be gained in creating art to express your emotions or opinions. Creating something that expresses what you have to say is a valuable communication tool just as being able to persuade with words as a writer or orator. 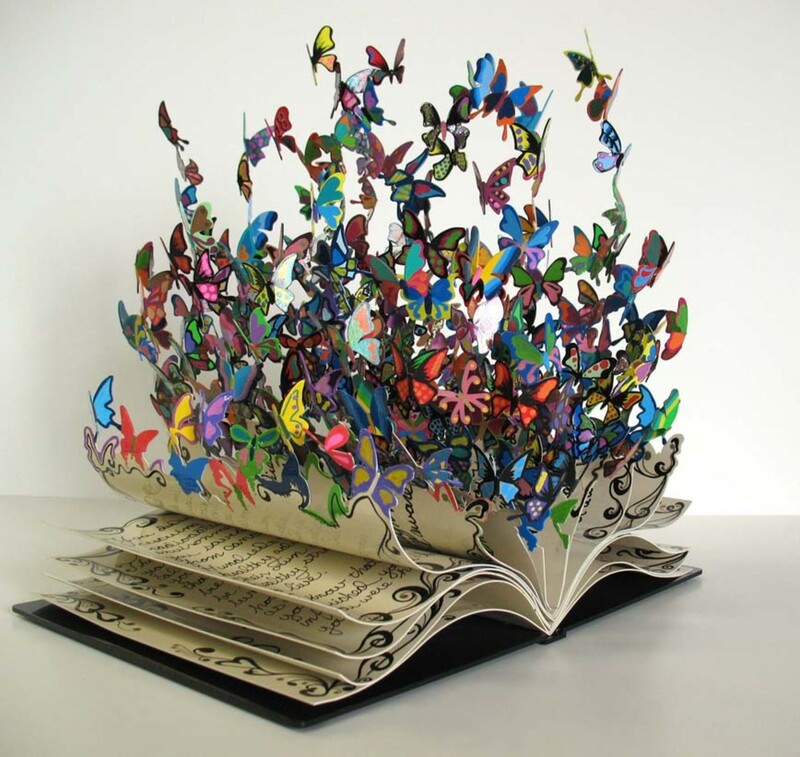 An altered book is obviously a book that has been altered or changed in some way. There are many ways to alter a book; I'll show you what I have done. I first found an appropriate book, "All Things Bright and Beautiful" by James Herriot. I picked it for its title, because I plan to put things in the book that I think represent beauty. The first pages that I created were a tribute to the book itself. 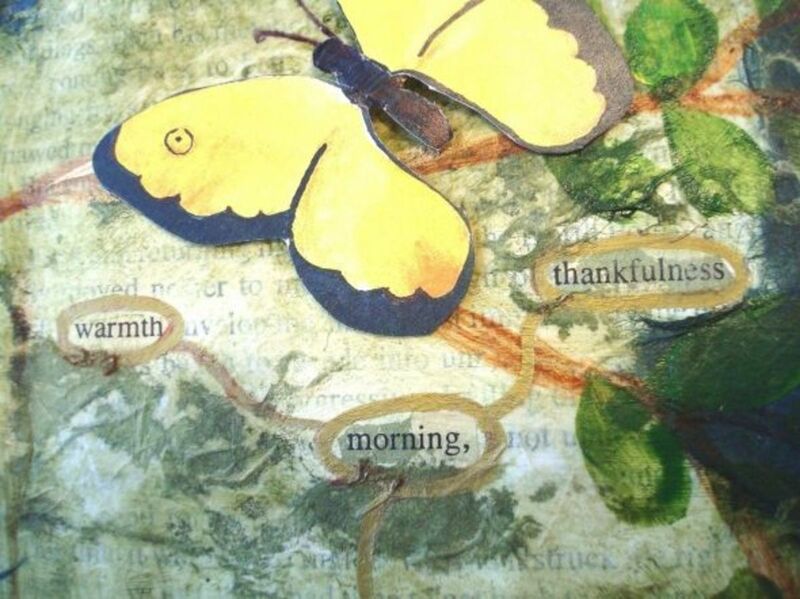 I collaged in the poem "All Things Bright and Beautiful" by Cecil Frances Alexander, "All things bright and beautiful, all creatures great and small, all things wise and wonderful, the lord God made them all". I found this poem in the front of the book, and I thought it would be a nice addition to the first pages I altered. 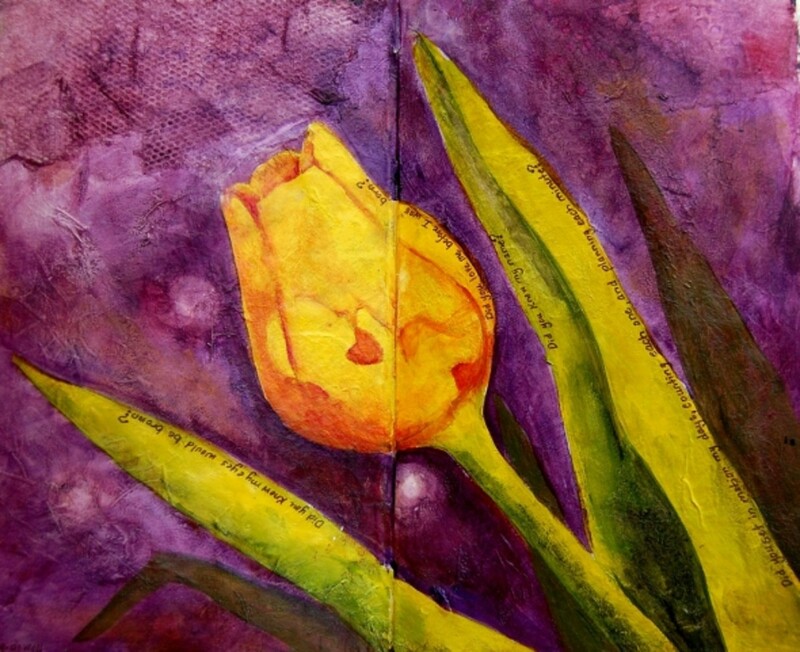 See my Art Journal Prompts page for ideas to keep you inspired with your art! Why Do I Alter Books? I know there are a few people, like librarians and teachers, who are probably screaming right now, "How could you do such a thing to a book!" I was taught in school to not even dog ear the page of a book, and look at me now: cutting, pasting, painting, drawing on the pages . . . tsk, tsk. I guess I'm just a rebel. I alter books because their pages inspire me and suggest creative possibilities. I find that if I spend too much time away from anything creative, I lose the inspiration to create. Altering books, for me, is like keeping a sketchbook. It is a place to play around with new ideas and techniques. It keeps me dabbling in things artsy while my next big project is simmering in my brain. It lets me try things out before I commit time, effort and supplies to a larger work. You may be asking, "Why don't you just use a sketchbook?" I do have plenty of sketchbooks that I use periodically. But staring at a blank page is sometimes a little intimidating for me. Rather than mess up a perfectly white page of a sketchbook, I feel that I can only make a page of a book better, so it reduces the anxiety of failing. Also I use the words in the book to inspire me. On this page, I used the words that were printed on the page to guide my creativity. I circled words that I liked and that gave me a theme to work with. 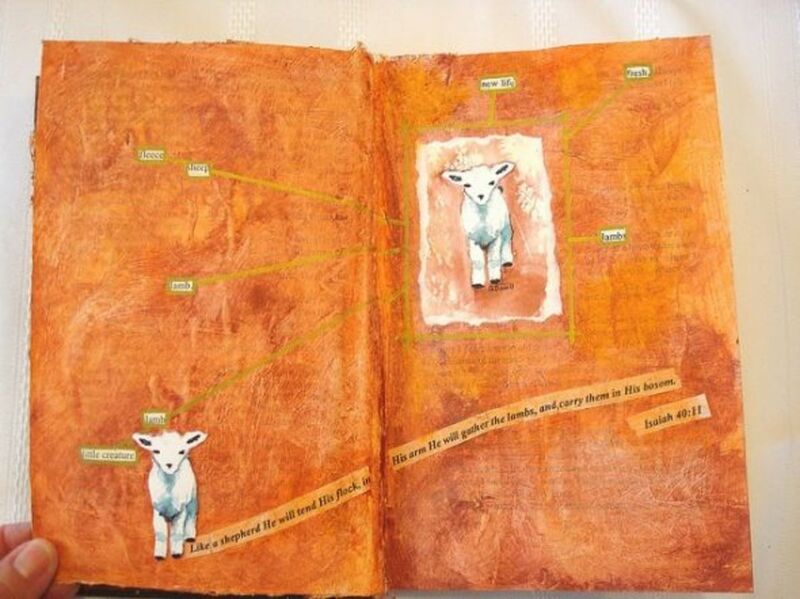 The words on this page were: lamb, little creature, sheep, fleece, new life, and fresh. 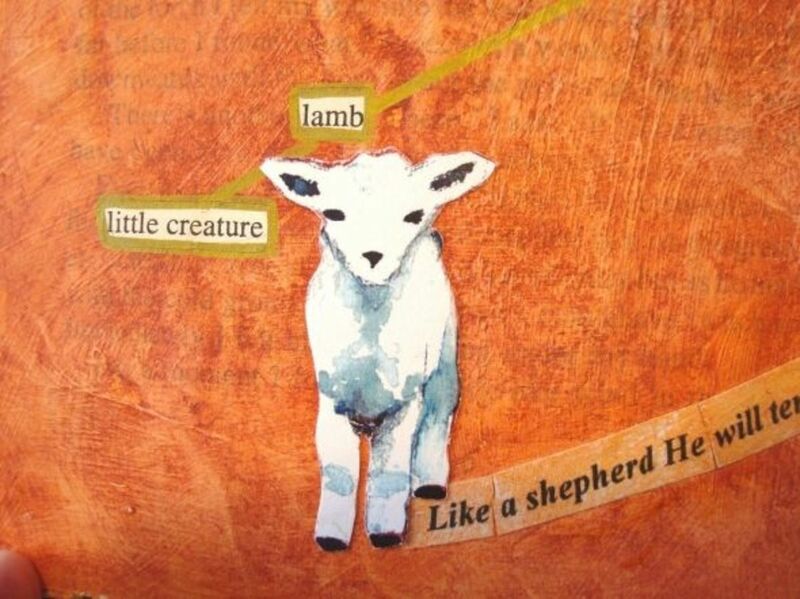 Then, I took some color copies of a lamb that I had painted and collaged them with the words that I had painted around. I then included my favorite scripture verse, Isaiah 40:11, "Like a shepherd He will tend His flock, in His arm He will gather the lambs, and carry them in His bosom." Voila! I've come up with something new inspired by the very pages of a book. 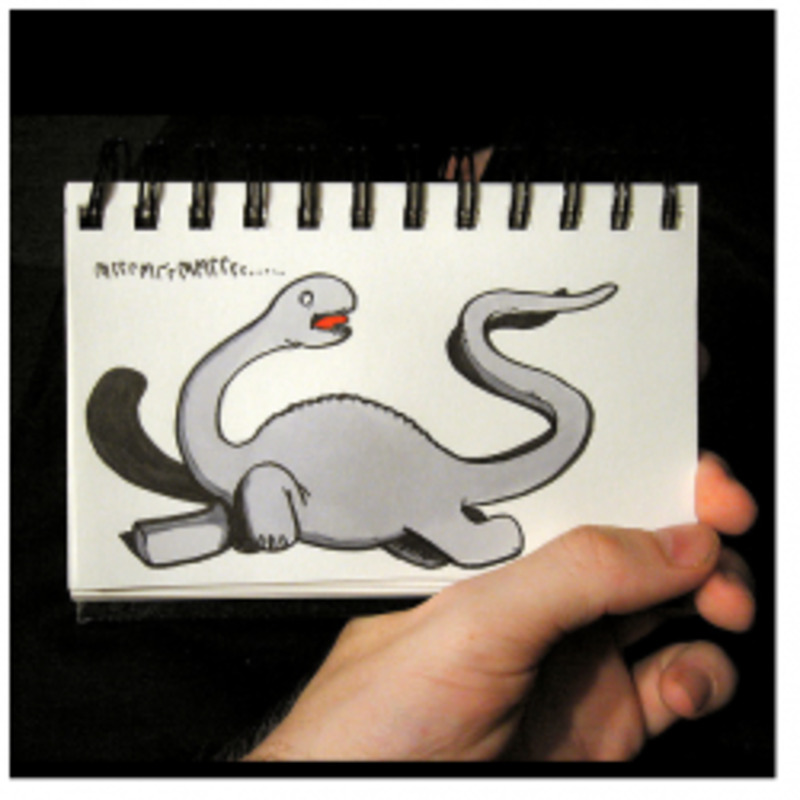 Try doing that with a sketchbook. There are endless supplies that you can use to alter books. I've shown here just the basics of what you need. Don't let the list I give keep you from coming up with other items. 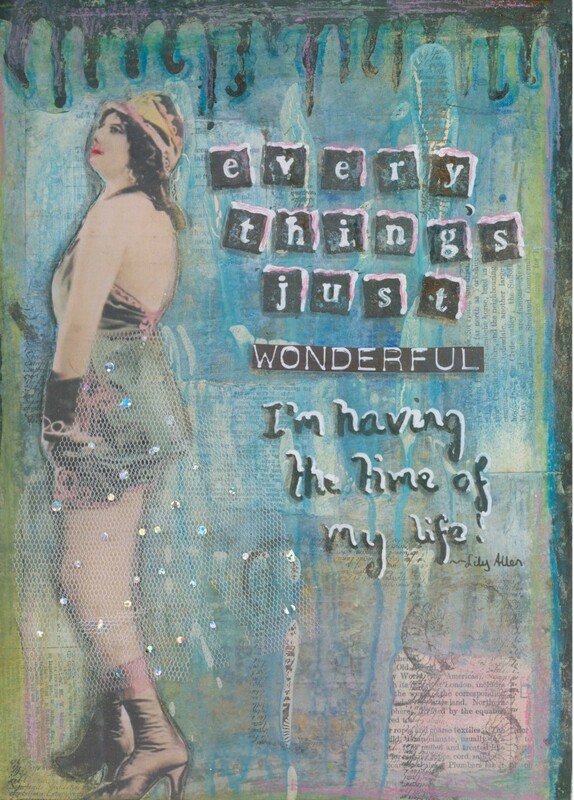 I do some scrapbooking and use many of those items in my altered books. 1. First you need a book to alter. I had this book in the attic and was getting ready to put it in a garage sale before I found another use for it. I've gone to used book shops and bought books that I thought would make good altered books. It is best to get a hard backed book in good condition. Find a book with a catchy title that will compliment whatever you will put in to it. 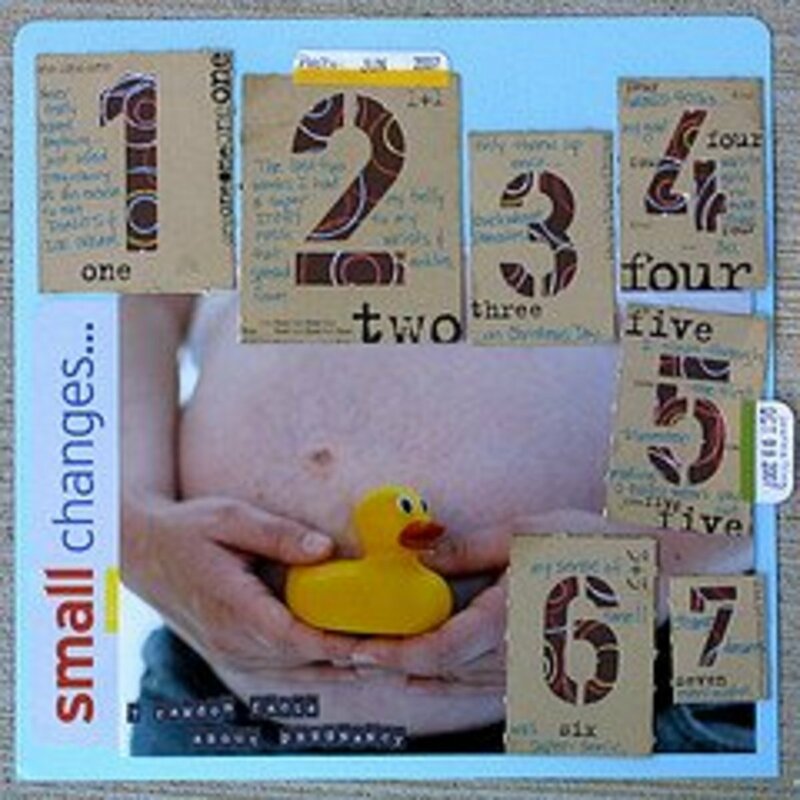 You can also use a picture book and work around the pictures, incorporating them into your work. I make it a rule to not spend more than a few dollars on a book to alter. Also, be aware that you can not sell these books after they are altered as they will contain the work of others. This is for sparking your own creativity. 2. A good glue would be the next item that you need. I'm still experimenting on different glues. I like rubber cement for some paper projects because it doesn't wrinkle paper. But, rubber cement does not work well if you are using paint or wet media on the pages. I do use a glue that is acid free. I've been using a scrapbook glue stick that has worked well. It does wrinkle the paper, but I've found that it is something that I can live with. I like the applicator on the Scotch Scrapbooker's Glue w/2-way Applicator as it has a wide tip on one end and a narrow tip on the other for different applications. 3. I use Golden acrylic gesso to cover unwanted words or pictures on the book pages, and I use it to prepare the page to accept acrylic paint or other media. 4. 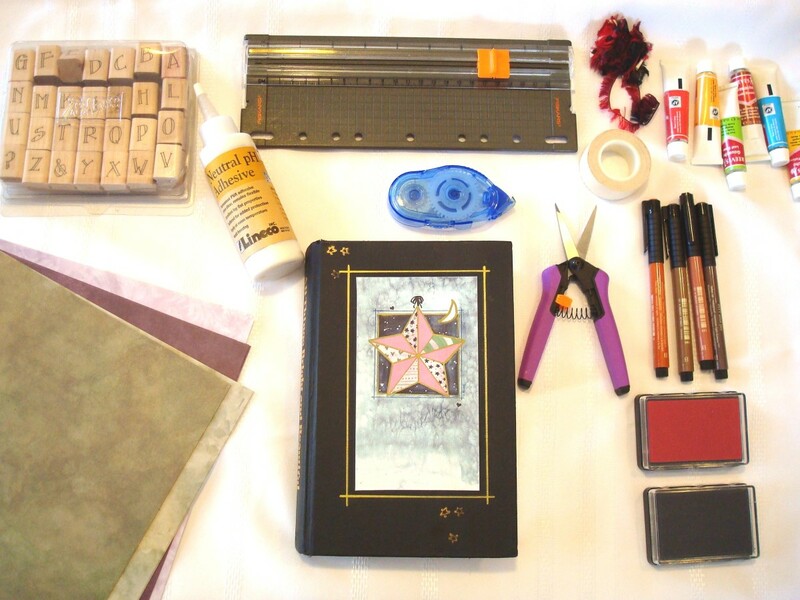 I use other supplies such as an X-Acto knife or scissors to cut paper - or the book pages, acrylic paint or other media suitable for paper, ink pads, stamps, collage paper and ephemera, ribbons, buttons - anything flat that can fit between the pages. If I want to mask items to keep on my page, I use removable labels to tape over the parts I want to keep before I gesso or paint over the other items on a page. 5. I also place wax paper between the pages to protect pages I'm not working on from gesso and paint. 6. I use Golden acrylic matte medium as a glue to attach my collage items to the pages. It dries clear. For the top coat over my collage, I use clear gesso. Great acid free glue to glue my book pages together. 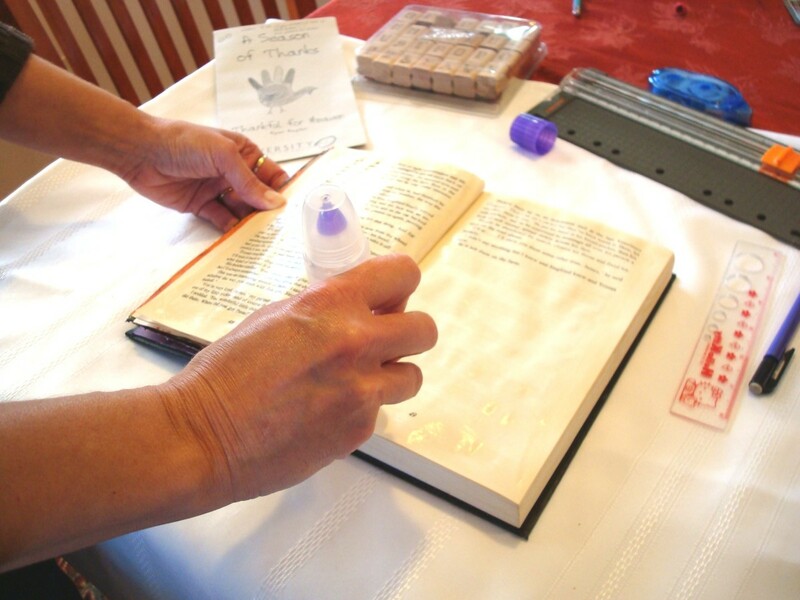 Using clear gesso as the finish coat allows you to write on your page. Clear gesso also keeps the pages from sticking together if you've used acrylic paint. After I have my supplies and a book picked out to alter, I find a page in the book with words or pictures that inspire me. I then circle words I want to incorporate in my design, and at the same time, I arrange them in a poetic order. I don't always start at the first page of a book, I tend to move around. Depending on what I add to my pages, I will eventually have to cut some pages out so that the book will lie flat. I then glue 4-5 pages together on either side of the pages I want to work with so that each side is a sturdy foundation for applying my collage, paint, etc. For this I use Scotch scrapbook glue that I listed previously in Altered Book Supplies. I spread the glue over the entire page, carefully making sure I glue right to the edges. Setting the book aside, I let it dry with a stack of books on top for a few hours. I then open the book to continue drying the pages for another few hours. Tip: To speed to the process, I sometimes glue several sets of pages at once. After the pages have dried thoroughly, I cover or mask over the words or pictures I want to keep with removable tape or labels. When that is finished, I take a brush and paint acrylic gesso over the entire page lightly. I sometimes like to see some of the other printed words peek through the gesso and paint. Tip: Putting wax paper between the pages will help keep gesso and paint from getting to other pages in the book. When the gesso is dry, I'm ready to start playing!! This has to be the best part of altering books - designing and collaging the pages! In the two pages I prepared in the last post, I saved some words from the book to incorporate in my design. These are the words in the order I saved them. "Dance on home in the sunshine as if a curving river breathing sweet air in the shade of the woods . . .the fragrance answered and paddled to me". Those words inspired my overall design. I first cut out a house (home) with four windows. Each window has a picture of each member of my family that I took from some photos. 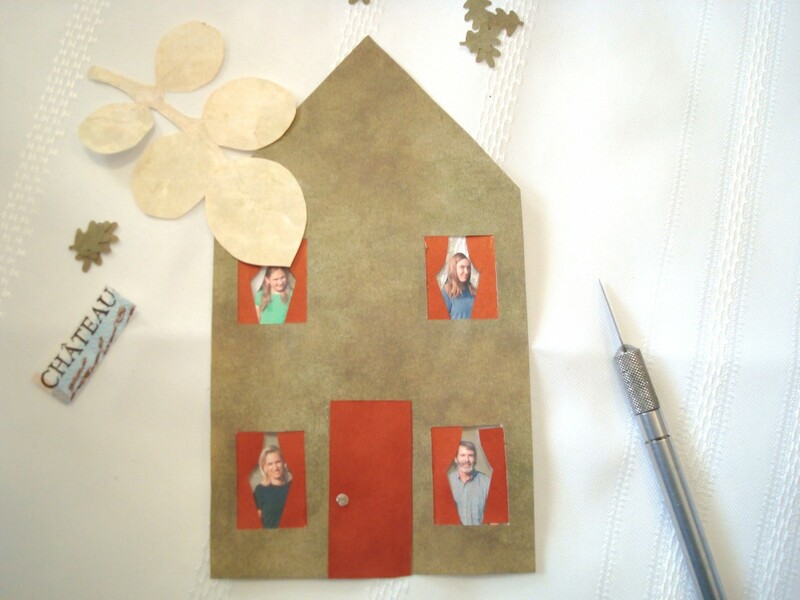 I then collaged this house to the page opposite the page that contained the words I saved. I cut the door open on three sides so that I could add something inside the door later. I like to have little openings in my altered books to add little surprises. It reminds me of the books I used to read to my girls. They loved opening the little windows to see what was behind them. To collage the paper cutouts to the book, I painted acrylic medium (see Altered Book Supplies) to the house and cut outs, laid the cut-outs in position on the page and put another coat of acrylic medium on top of the cutouts so that all the cut-outs are contained in the acrylic medium. I had to be sure not to glue the door down so I could open it later. I added more paper embellishments such as paper leaves (for the woods), and some paper doilies, etc. When I finished the collage, I painted the collaged pages with acrylic paint thinned with acrylic medium. I then lightly painted over the entire surface of the two page spread I was working on. Painting over the whole page helps to unify everything. I ended up adding more paint after I did the collage work. When you apply the paint, be sure to wipe off the excess with a towel before it dries as you just want a very light layer of paint. At any point, I can add more collage and paint, and I often go back and forth with collage and paint making sure I let each layer dry thoroughly. When I think that I am about done with the collage and painting portion, I peel off the removable tape I used to mask the words that I wanted to save. I then apply a coat of clear gesso over everything. Clear gesso allows the use of ink pens for writing on the page and it also keep the pages from sticking together when the book is closed. I then highlighted the words by boxing them in with a permanent marker and creating a pathway between the words so that my readers can follow the words as I intended. 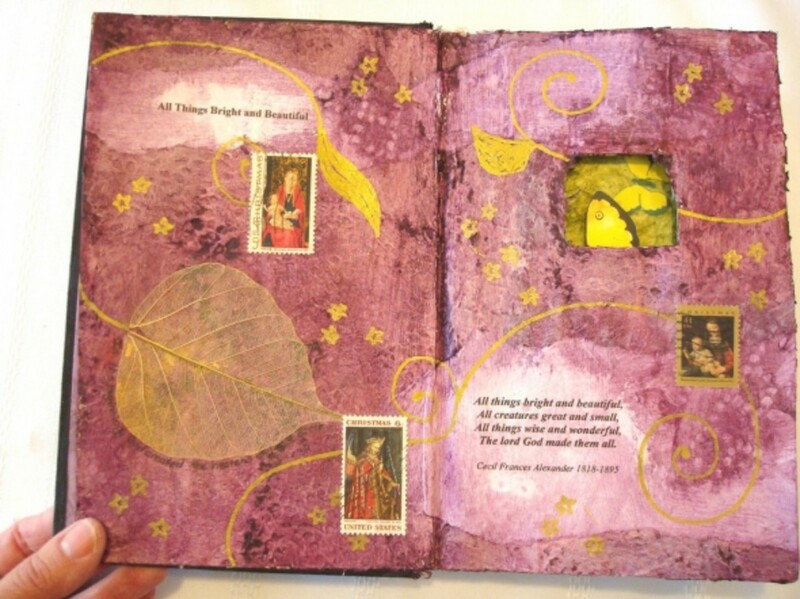 Here is the finished page of my altered book tutorial. As you can see, I highlighted a few things with a permanent marker in dark brown. I also stamped a "D" in three places (the "D" is our family name initial). Since I saved the words from the book that inspired me, I like to go back and read them on occasion. "Dance on home in the sunshine as if a curving river breathing sweet air in the shade of the woods . . .the fragrance answered and paddled to me". And the "behind that door" surprise, I added a favorite scripture verse, Proverbs 24:3-4. "By wisdom a house is built, and through understanding it is established, through knowledge its rooms are filled with rare and beautiful treasures". I now have a permanent record of my thoughts as I created this page. I can now use this theme to inspire a painting in the future. I have already come up with several ideas from this exercise that I would like to try in a larger painting. Doing this exercise has gotten the ball rolling and my creativity going . . . hope it has inspired my readers as well. Getting started with altered book art and other altered projects. 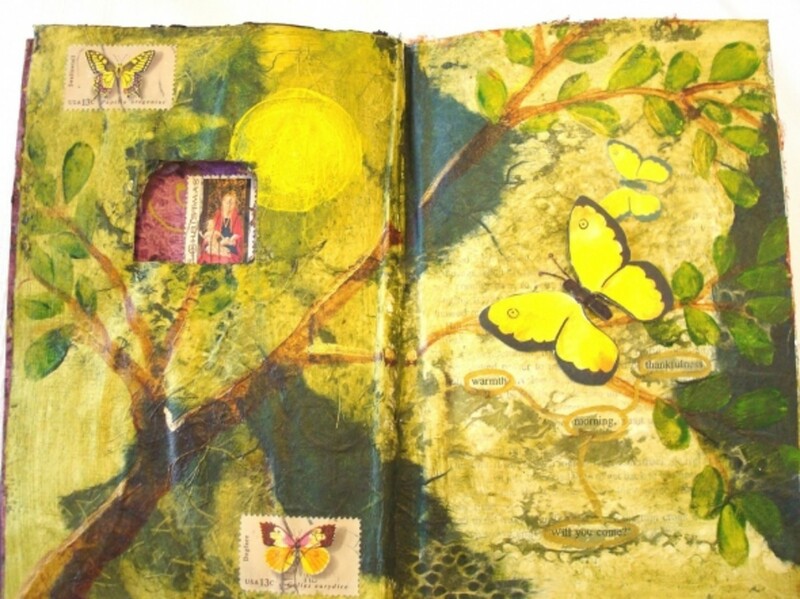 A gallery of altered books incorporating collage, painting, and poetry. Beginner techniques, tips, and tutorials to help you create you own altered books. A great gallery where you can flip through the pages of the altered books. A little different take on altering books as Guy Laramee actually carves landscapes from the pages of books. 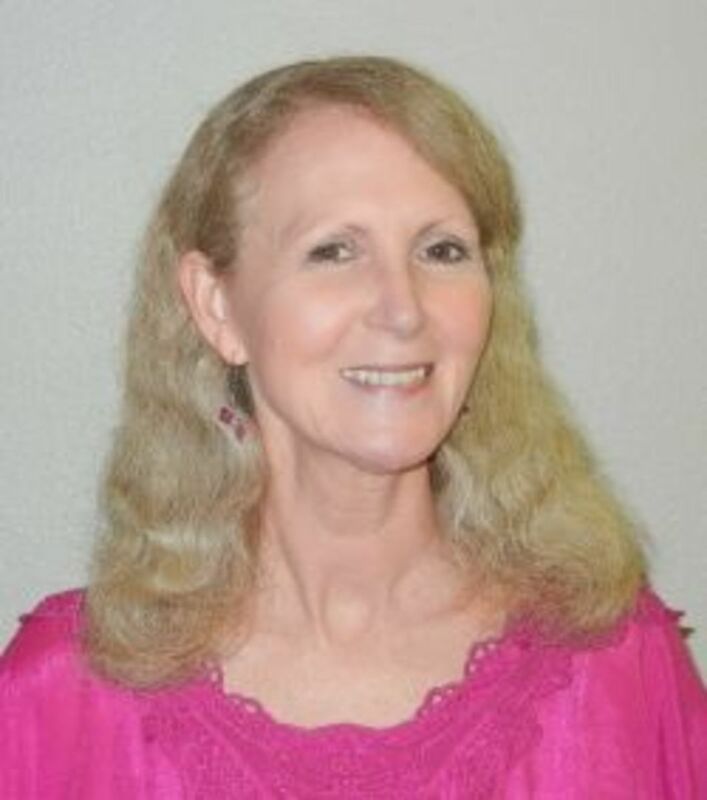 Terri Sproul has a series of videos on altered books that are well worth watching. Below is one of them. I usually collect my own scraps to use in the collage part of my altered books, textured papers, napkins, scrapbook paper scraps, old ticket stubs, brochures, etc. I have found a blog that has free vintage clip art you can print on your printer. Go to The Graphics Fairy. 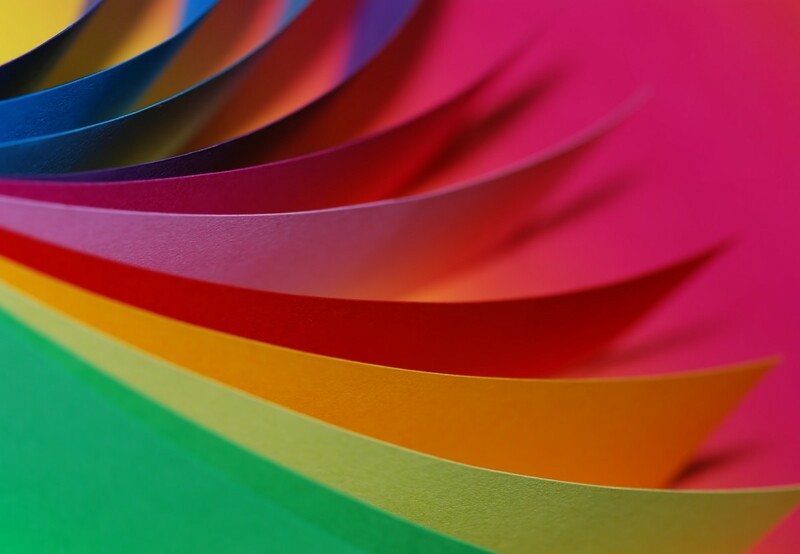 If you are starting from scratch and do not have a supply of paper scrap images then these items below are great sources to get you started. I find having an assortment of a lot of different images helps to inspire ideas for my pages. Would You Try Altered Books as a New Hobby? oh my! That is sooo great! Thanks!! Great article! Never done altered books, but I love paper art and collage, so it is probably right up my alley! There's a cool online shop for scrapbooking-type supplies that is, sadly, going out of business, but they are selling their stuff off cheap! It's called skybluepink.com - I have ordered from them over the years for paper crafting items. Thanks for the wonderful ideas! I've been interested in art and have made art for as long as I can remember, but this is my first time hearing about altered books! I love it! It's especially neat how you include bible verses in your works. Thanks so much for sharing! I would surely try this. Maybe not as an everyday hobby. It does seem to involve some definite time. But I can't wait to try this as a Christmas gift. It would be so unique and beautiful. To try to include a family story and some pics and etc. Thank You for writing this, very inspiring. Thank you linfcor. That is my hope to inspire others to tap into their creative side. You have given me inspiration to give it a try ! Great hub ! What a unique and cool idea! Congrats on LOTD! Yes, I guess I should give it a try... and wait until my gf will read your lens! She will surely find it a great idea for a new hobby! It is very creative and beautiful hobby. I have never heard of altered books. This is a beautiful lens about a very interesting topic! Congrats on your LOTD! I would never alter a rare book and probably not a non-fiction book, but some books, especially picture books that have torn pages or other damage are great for altering. Well done on the LOTD. However the librarian in me winces at the thought of receiving a book back in this condition! Congrats on LOTD! Yes, I have been wanting to try this for awhile. Thanks for the inspiration! Congratulations on LOTD! Great creativity..I've only made books from scratch for gifts, this sounds like a easier way to do it...thanks for sharing! Not really. Congratulations on getting LotD! Congratulations on LOTD!! You are a very creative person, so nice to see that you follow your passion. I always say if it makes you Happy then do it!!! Congratulations on LotD and thanks for introducing us to a new hobby. The idea of altering a book doesn't bother me at all... I believe itâs a wonderful, beautiful way to express your creativity. I would alter a book, why not!? I scrapbook and paint myself and would love to add book altering to be part of my creative outlets as well. Thank you so much for this inspiring lens and congratulations on LotD!! What a wonderful project! Congratulations on an inspiring Lens of the Day! Congratulations on Lens of the Day! Your lens is wonderful, with so much good information. It does look like fun to do, and would make that book a treasure besides. Well detailed! I think I'm going to have to try this. 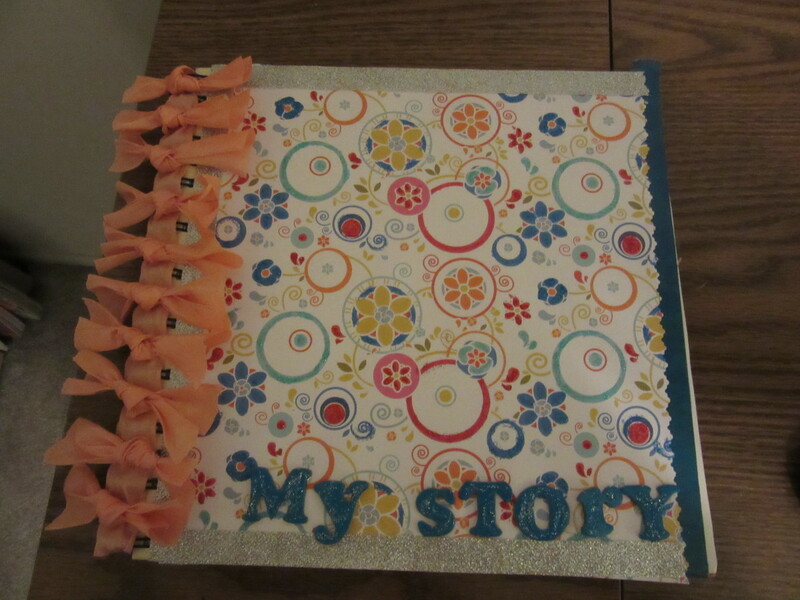 Altered books make a great gift for a special birthday or other occasion. I love expressing my creativity in them Great lens ! Well, as a new hobby probably not, but trying to alternate one book, just to test what it is like definitely yes. Wow yes i want to try altered books as a new hobby, i hope it will be great. Maybe the empty pages at the beginning and back of the book. Why not! I love the whole idea. I'm so sorry this was not my idea for a lens. Very nice lens. I've been doing this for years - but I never knew it was a "thing"... lol - this is a great lens! This lens equals shining inspiration. Thanks for putting all of this good stuff out there. I'm empowered! This is an excellent lense! My daughter alters books very beautifully. I'm too busy expressing myself in poetry.Blessed. Very neat idea, something I've never thought of! *** Blessed by a SquidAngel *** who love altering just about everything! I think it is a novel idea worth trying. Yes, I think it's an art form and if I had more time on my hands, I would definitely try it. The ones you created were beautiful - well done...blessings! I would and I have, I was just adding to my journal yesterday - getting ready to start a new drawing - I LOVE IT !!! I added some movie tickets, doodles and stickers - it is so much fun despite what others do say - I SAY _ LET YOUR IMAGINATION GO- HELPS LET GO OF STRESS !!! I don't know...I think so if it were the right book though. I no longer do crafts because I have so many interests. But I always admire creative ideas, arts and crafts. Interesting concept. Blessings on a very unique lens. This is a great idea. I love books so it would be a great hobby for me. Blessed! I've been wanting to try altering a book. It's going to take a long time to find a book that I'll feel okay about using, though. What a great way of using books that will probably never be read again. I love books and never dog-ear pages but there are books that have outlived their time and it's better to use them and make them beautiful than throw them away. This is a really inspiring page. Wow - this is really cool. I'm not sure I'm artistic enough to make it look this good but it would be worth trying! What a fun and interesting hobby this is! Thank you for this very interesting lens! Thanks for sharing such a wonderful lens. Yes, I would try this with an older book. Quite beautiful and whimsical. So very nicely done. Blessed! I like your lens and i appreciate your work, you really deserve thumb up and like. Popping back in to sprinkle some Angel dust on this lens. I have never heard of this idea. What beauty! Thanks for the tutorial. I just might attempt this -- although not with one of my faves. Best of luck! I've done some altered cards when I make valentines for my family each February. Guess I'm working my way up to altered books. This would be fun to do with all my grandkids! Back to spread some Angel Dust - your lens stuck out as this is my very first day of flying around. Loveliness, inspiring altered books. I love working in my visual journal, everyone should try it!! Okay you've done it - now I have a new hobby. Very interesting and creative lens! But I would be sorry to use the book in this way, if only poetry book, where there is sufficient free space - yes, it could be a great gift! Thanks for the great idea, before I was aware of it! Best wishes! Your right altered books are a great way for someone to get their creative juices flowing. What an interesting idea. I've never heard of altered books before. Thank you for sharing about them, and posting so many resources. Very cool and creative. Nice lens! This looks so creative and fun task. I really love these, I haven't tried to make one yet, but I want to. I'm so impressed by your altered books and look forward to making some of my own. Beautiful lens - Angel Blessed! What a fun and creative use for books and a beautifully done page. Blessed by the fine Arts Angel. 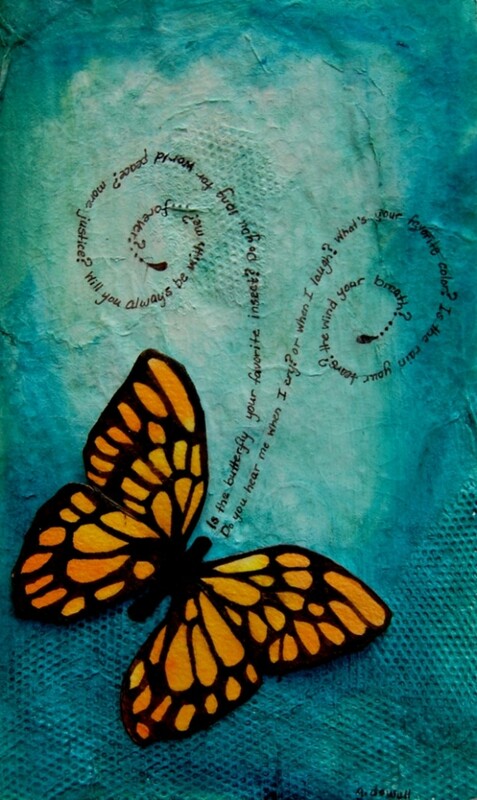 Nice lens - altered art is such a great way to express your individuality. Very interesting and artistic - I'd never thought of something like this before! Great lens! Lovely! This is something I would really enjoy. Found you in the 92% forum and decided to stop by. Won't be long before this one goes all the way to 100%. :-) Very nicely done. @John Dyhouse: I'd be interested in seeing your lens when you publish! Thanks for leaving a comment. 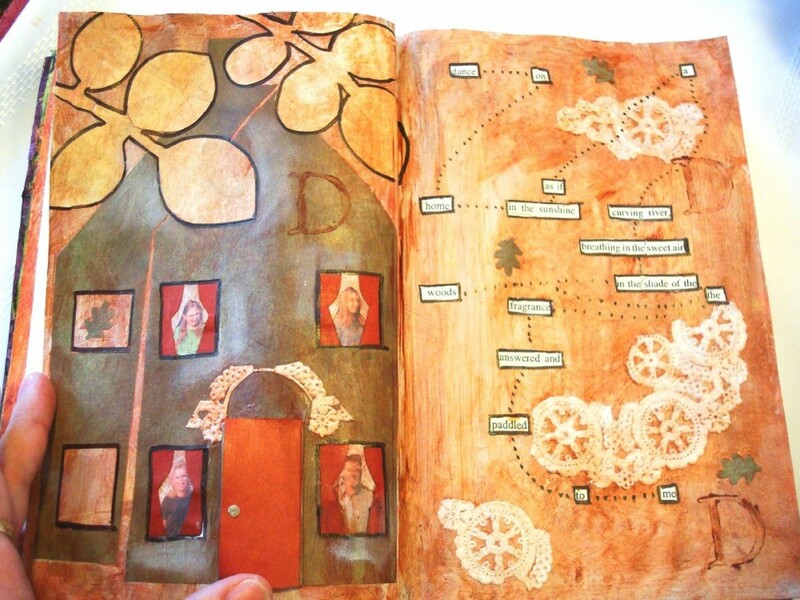 Great lens and exposition of the art and method of altered books. I am new to this and am experimenting with glue books (usually using hand made books), I am in the process of putting a lens together on what this means to me. 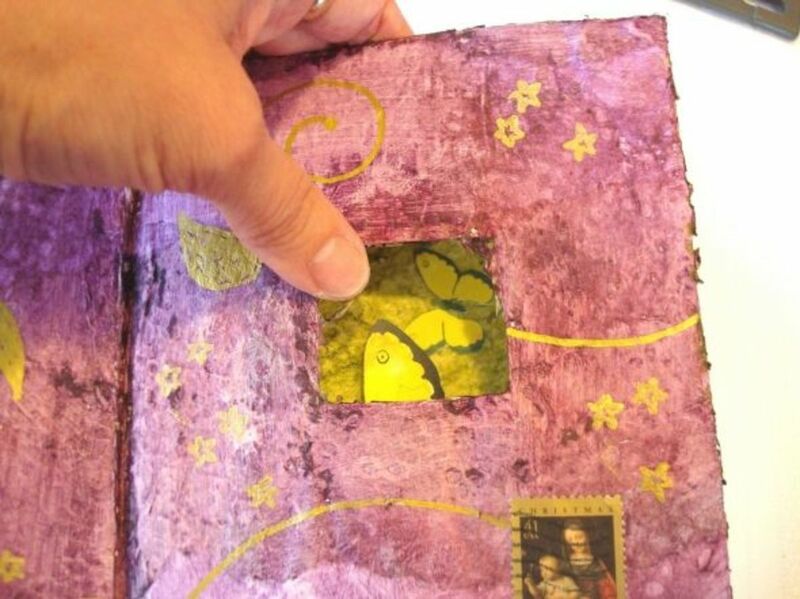 Great tutorial and thanks for helping to spread the word about altered books and altered art. @myraggededge: Thank you so much for your blessing! I'm so glad you liked the lens. @anonymous: Thanks for the blessing! Excellent lens on an unusual craft that is accessible to anyone. Altering books has a bit of a "punk" feel to it! Bit of anarchy mixed with sincere appreciation of the written word. Blessed by your neighborhood angel - and congrats on a well deserved purple star. @sukkran trichy: Thanks for the blessing. This made my day! @Harshitha LM: Thanks for stopping by. I enjoyed taking your food quiz, but I didn't do well on it. Will have to brush up on my food knowledge! @JoyfulPamela2: That is a great idea! I'll have to explore that option as well. Thanks for commenting.